Product prices and availability are accurate as of 2019-04-20 16:27:42 UTC and are subject to change. Any price and availability information displayed on http://www.amazon.com/ at the time of purchase will apply to the purchase of this product. 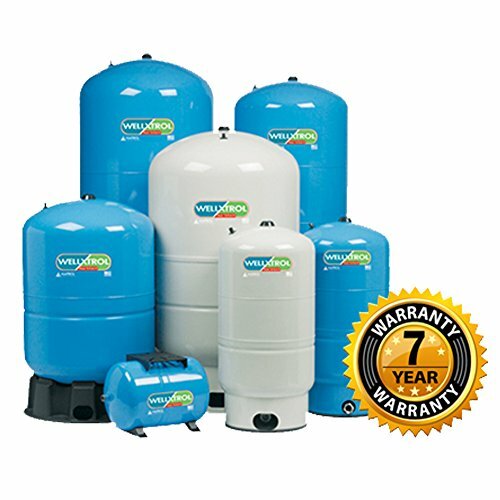 WELL-X-TROL Professional redefined the industry with its advanced engineering and innovative product design including the pre-pressurized well tank, sealed-in air charge, and unique water chamber design. With proven performance since 1963, WELL-X-TROL Professional continues to deliver unparalleled results making it the most trusted choice of professionals in today's market. WELL-X-TROL Professional offers many unique features that result in consistent, reliable performance, including design elements that prevent tank corrosion and reduce wear and tear on the well pump. Models with gallon amount and dimensions found below. "D" denotes Durabase. Otherwise the model comes with just the steel base. WX-101 - 2 Gallons - 8" x 13" WX-102 - 4.4 Gallons - 11" x 15" WX-103 - 7.6 Gallons - 11" x 22" WX-201 - 14 Gallons - 15 3/8" x 25 1/8" WX-201D - 14 Gallons - 15 3/8" x 25 1/8" WX-202 - 20 Gallons - 15 3/8" x 31 5/8" WX 202D - 20 Gallons - 15 3/8" x 31 5/8" WX-202XL - 26 Gallon - 15 3/8" x 38 1/4" WX-202XLD - 26 Gallon - 15 3/8" x 38 1/4" WX-203 - 32 Gallon - 15 3/8" x 46 1/2" WX-203D - 32 Gallon - 15 3/8" x 46 1/2" WX-205 - 34 Gallon - 22" x 29 5/8" WX-205D - 34 Gallon - 22" x 29 5/8" WX-250 - 44 Gallons - 22" x 36" WX-250D - 44 Gallons - 22" x 36" WX-251 - 62 Gallons - 22" x 46 3/4" WX-251D - 62 Gallons - 22" x 46 3/4" WX-255 - 81 Gallons - 22" x 56 3/8" WX-255D - 81 Gallons - 22" x 56 3/8" WX-302 - 119 Gallons - 26" x 62" WX-302D - 119 Gallons - 26" x 62"